Boasting baseball's best offense, the Blue Jays are a lock to lead the majors in runs and contend for a title. But do they have the depth to end their World Series drought? This week, SI.com is previewing all 30 MLB teams for the 2016 season, counting down to the No. 1 team in the league. At No. 4: the Toronto Blue Jays. The Blue Jays fell two games shy of winning the AL pennant last season and are returning this year with 2015’s most prolific offense not only intact but also arguably improved. Full seasons from deadline addition Troy Tulowitzki and leftfielder Michael Saunders, who combined to start just 49 regular-season games for Toronto last year, should help. Toronto also hopes to get four healthy months from sophomore second baseman Devon Travis, who was active for just three months last season and fighting a left shoulder injury (one that was surgically repaired in November) for much of that time. The Jays can also reasonably expect improvement at the plate from centerfielder Kevin Pillar, who is coming off his first full major league season, in his age-27 campaign. Surely there will be some regression elsewhere, most likely from the first base platoon of Chris Colabello and Justin Smoak, but Toronto has every reason to expect to lead the majors in runs scored for a second consecutive season. Meanwhile, a full season of Tulowitzki will also improve the Jays in the field, and a full season of Marcus Stroman, who made just four starts last year due to a torn knee ligament suffered in spring training, could give Toronto the front-of-the-rotation ace it lacked for the first four months of 2015. In the bullpen, the Blue Jays spent the early part of last year trying to establish a closer before finally landing on rookie Roberto Osuna. This year, both Osuna and veteran Drew Storen enter the season with closer experience, and each is capable of dominating in the eighth or ninth inning. Their presence will allow the Jays to keep lefty Brett Cecil in the setup role for which he is best suited and gives Toronto an impressive Big Three in the bullpen, something the team lacked until the final two months of last year. You may have noticed a pattern above. The Blue Jays were a different team after last year’s trading deadline, when they added Tulowitzki, David Price, leftfielder Ben Revere and relief help. This year, they more closely resemble that post-deadline version of the team heading into the season, with Tulowitzki still in place, Stroman replacing Price, Saunders replacing Revere and Storen replacing free agent Mark Lowe. Tulowitzki was the first of those reinforcements to arrive last July, and from his first game with the Jays on July 29 through the end of the regular season, Toronto went 43–18—three games better than any other team in the AL—and posted a .705 winning percentage, or a 114-win pace over 162 games. The Jays won’t be that dominant this season, but they have as much of a chance as any other team of leading the league in wins and winning the pennant—and possibly even taking home their first championship since 1993. “A full season of Troy Tulowitzki” is as hoary a spring training cliché as a player being “in the best shape of his life.” Expecting Tulo, Saunders (who has appeared in just 87 games over the last two years) or Travis to avoid the disabled list beyond the latter's remaining two months of rehab is cockeyed optimism. I already mentioned the likelihood of regression from the platoon of Smoak and Colabello, who hit a combined .277/.334/.496 with 33 home runs last year. The Jays are also likely to see some regression from defending AL MVP Josh Donaldson and fellow sluggers Jose Bautista and Edwin Encarnacion, all of whom hit 39 or more home runs with an OPS+ of 149 or better last year. Donaldson turned 30 in December. Encarnacion turned 33 in January and seems to be constantly suffering from one nagging injury or another, including an oblique strain this spring that could threaten his availability for Opening Day. Bautista is 35 and has had his share of injuries as well since leading the majors in home runs in 2010 and '11. Bautista and Encarnacion, meanwhile, are both entering their walk years amid unsatisfactory extension talks with the Blue Jays, but age, injury and the simple difficulty of repeating the level of production they provided last year seem more likely to factor into their 2016 performances than their next contract. Speaking of age, catcher Russell Martin is 33 and has had postseason innings added onto his full-time–regular-season workload in seven of his last eight seasons. 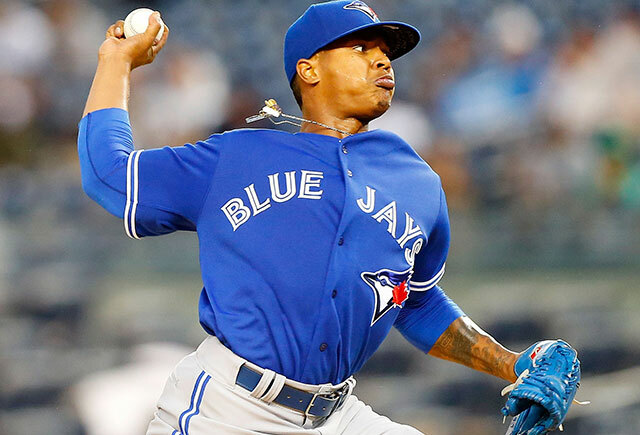 In the rotation, Stroman, who is 5’8” and will turn 25 in May, has never thrown more than 166 1/3 innings in a professional season and threw just 54 last year including his minor league rehab assignment and the postseason. Marco Estrada and J.A. Happ are middling journeymen in their early thirties coming off spikes in performance that they seem unlikely to repeat. R.A. Dickey is a 41-year-old knuckleballer who has been a perfectly league-average innings eater in his three years in Toronto (100 ERA+, 654 2/3 innings pitched). As for the fifth spot, that seems likely to be claimed by sophomore Aaron Sanchez, who posted a lousy 1.14 strikeout-to-walk ratio in 11 starts last year before landing on the disabled list and being repurposed as a setup reliever. His backup for that spot includes Drew Hutchison (5.47 ERA in 28 starts last year), veteran Gavin Floyd (14 starts and 92 major league innings pitched in the last three years due to a variety of injuries) and swing-man Jesse Chavez (4.37 ERA in 26 starts for the Athletics last year while benefiting from a far friendlier home ballpark). The bullpen, meanwhile, gets pretty thin after that top three of Osuna, Storen and Cecil with Sanchez likely in the rotation, lefty Aaron Loup currently down with a flexor strain and Liam Hendriks and 2015 deadline additions Lowe and LaTroy Hawkins all having departed for one reason or another. With the Red Sox ascendant, the Yankees still relevant and no clear patsy in the division, the Blue Jays could have a much tougher to the postseason in 2016 than they had a year ago. Even if they do suffer injuries and regression, the Blue Jays are going to hit the snot out of the ball and score a ton of runs. They are also going to play outstanding defense (they led the majors in park-adjusted defensive efficiency in 2015 and, again, should be better at shortstop this year), and they have enough back-end talent in the bullpen to expect a good performance from that unit—one that is the most malleable part of any team via in-season reinforcements and affordable deadline acquisitions, as they Jays themselves demonstrated last year. I undersold the dominance of the 2015 Blue Jays’ offense. Toronto didn’t just lead the majors in scoring last year; it scored 29% more runs than the major league average and 17% more runs than the second-place Yankees. The last team to outscore the major league average by 29% or more was the 1976 Reds, better known as the Big Red Machine and widely regarded as one of the best teams in major league history. To find the last team to outscore the runner-up in run scoring by 17% or more, you have to go all the way back to the 1931 Yankees of Babe Ruth and Lou Gehrig, who outscored that year’s Indians by 20% with 1,067 runs, good for 6.88 runs per game. year team r/g lg. Avg. % vs. lg. Avg.